This project lets you turn a clean tuna or cat food can, or the plastic thing that holds the icing for refrigerator cinnamon rolls, some easy crochet, fabric scraps, and glue to make an attractive pin cushion for your sewing basket or for gifts. Coil yarn or string in whatever can-like object you want to use until the yarn covers the whole inside bottom of the can. Measure the amount of yarn you used. 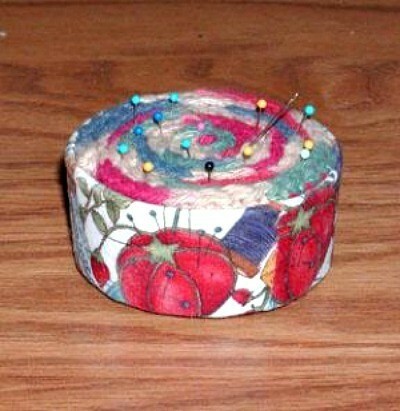 To make the pin cushion that will fit inside the can, make a crochet chain the measured length plus 1/2 inch - 1 inch. Single crochet in the second loop from your hook. When you get to the end, chain one, turn and single crochet to the other end. Repeat until the width of your piece is roughly the height of the can. Cover the outside of the can with a pretty fabric scrap, using decoupage or white craft glue, overlapping the top and bottom about 1/4 inch. Let the glue dry, then cover the fabric with a coat of decoupage glue or spray polyurethane. This helps keep the fabric clean. Cut out a piece of felt slightly smaller than the bottom of the can and glue it to the bottom. Now roll up your crochet piece, with the top of the piece (the last row you worked) at the top and fit it into the can. It should be a bit tight and will stay in the can without glue.